I finally found some time to bake for Dessert Corps again this week. I really do love doing it, even if it's very hard not to take a taste of the finished product. I'm also considering this post as my contribution for Fight Back Fridays, because allowing the soup kitchen to serve homemade desserts rather than the food "product" alternatives is food justice in action. Sometimes I think about doing a quality control, but in the end self-control kicks in and I choose not to hand over a dish with a piece missing, but boy oh boy it was hard this week. The local CSAs donate some of their extra fruit during the summer months to the soup kitchen, so I didn't pick my fruit, it picked me. I kind of like the surprise element to it all. 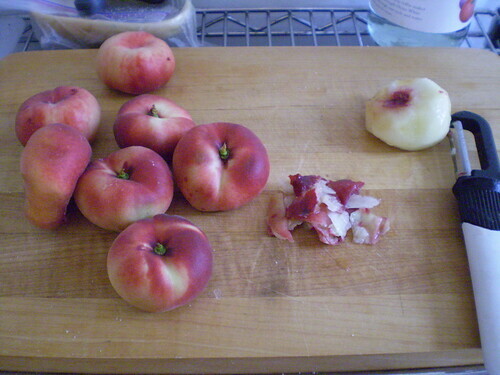 This week they had some extra doughnut peaches (also known as Saturn peaches or pan tao peaches) and blackberries. Doughnut peaches are a very sweet heirloom variety of a peach that are delicious. They are also less acidic than the larger more common variety of peaches. I set out to think about what to do with these star ingredients. 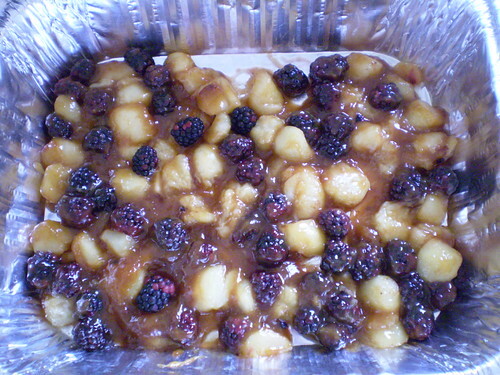 I love the combo of blackberries and cornmeal but wanted to make a one-dish dessert that would be easy to serve, so that ruled out making a blackberry sauce. I also wanted to utilize all the fruit so it didn't go to waste. I was leaning towards a cobbler but I wasn't super excited about it. 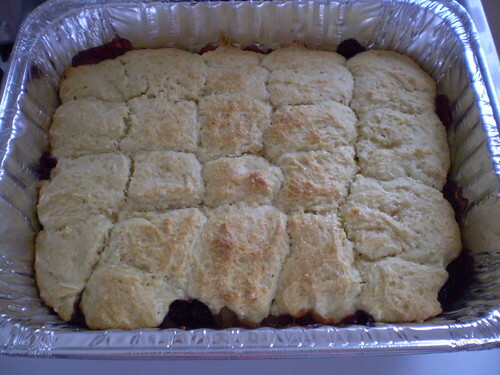 Then I found a recipe for a cobbler that incorporated cornmeal into the biscuit topping. Indecision ended there. Blackberries and cornmeal baked goods (think pancakes) are a natural pairing. That matched with the sweetness of the peaches would be excellent. Cobblers are a pretty simple dessert to make and don't require any stand mixers or fancy equipment. I have always loved old-fashioned American style desserts despite their humble techniques and plain Jane appearances. There is something so comforting to me about being able to whip up a dessert with not more than a bowl and a wooden spoon (dream bubble pops above my head to my creepy 1950's sitcom fantasy of me and one of those frilly half-aprons setting out a pie to cool in my window). Back to reality and East Williamsburg. Regardless, a cobbler dough is a cinch to put together all in one bowl. 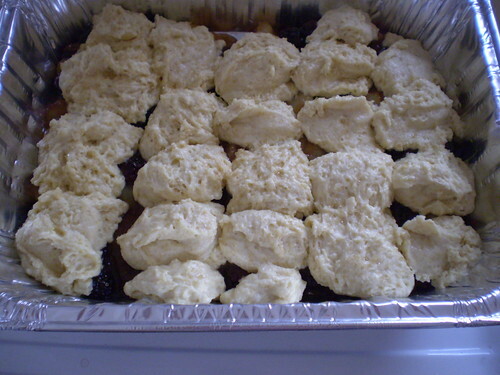 It is a type of biscuit dough and as soon as you mix the wet ingredients into the dry ones you can smell that doughy goodness. Set that aside while you prep the fruit. Peel and dice your fruit, peaches in this case, and mix in a pot with a thickening agent, in this case cornstarch and some sort of sugar, a bit of lemon juice, cinnamon and a pinch of salt. Mix together and let cook for a mere five minutes. 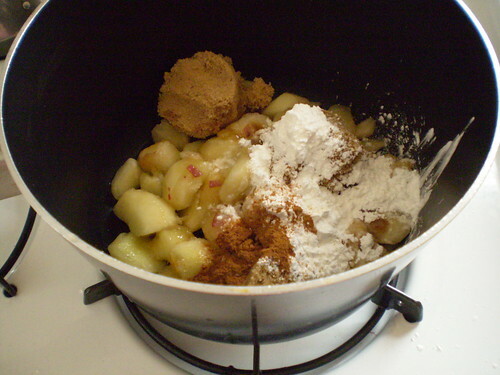 You're fruit mixture will be transformed what looks like and smells like the inside of a slice of warm pie. Yum. I think I might consider using less sugar next time, because I was concerned that the amount used in this recipe might mask the natural flavor of the peaches. But, being that this recipe was Southern in origin, I just went with it. Peach and Blackberry Cobbler Adapted from Epicurious and Down Home with the Neelys. 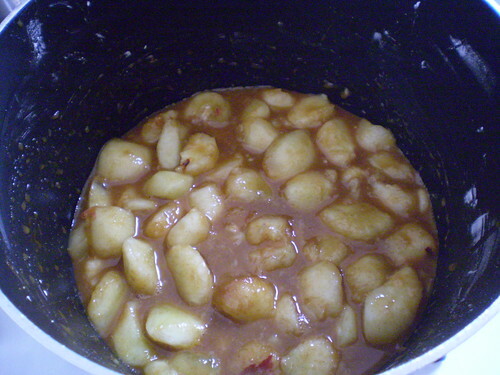 Try this in winter time too with whatever is in season (apples, pears).